As an Arctic storm rages along Barents Sea coast, company Novatek signals that it will move its large-scale reloading of LNG away from Norwegian waters. Company representatives confirm to newspaper Kommersant that the reloading of LNG in the Sarnes Fjord outside Honningsvåg, Norway, will come to an end in the course of 2019. The operations will instead be moved to Russian waters, most likely to an area near the island of Kildin. The information comes as a major storm has raged along the Norwegian Arctic coast. That has resulted in a halt in reloading operations in Honningsvåg. Up to nine major tankers have been circling around the Norwegian Arctic port as strong winds have prevent reloading of the liquified natural gas. The bottleneck created a serious situation for Novatek, the Russian natural gas company, that is dependent on the reloading for its LNG exports from Yamal. However, it is not the weather conditions that is making Novatek move out of Honningsvåg. Behind lies a good dose of politics. In addition, the Russian government in March this year adopted legislation that allows Novatek to expand the application of its foreign-flagged Arctic LNG carriers in Russian waters. That opens up for reloading also on the Russian side. According to Kommersant, Novatek intends to launch big-scale ship-to-ship reloading of LNG by the Kildin island before the end of 2019. 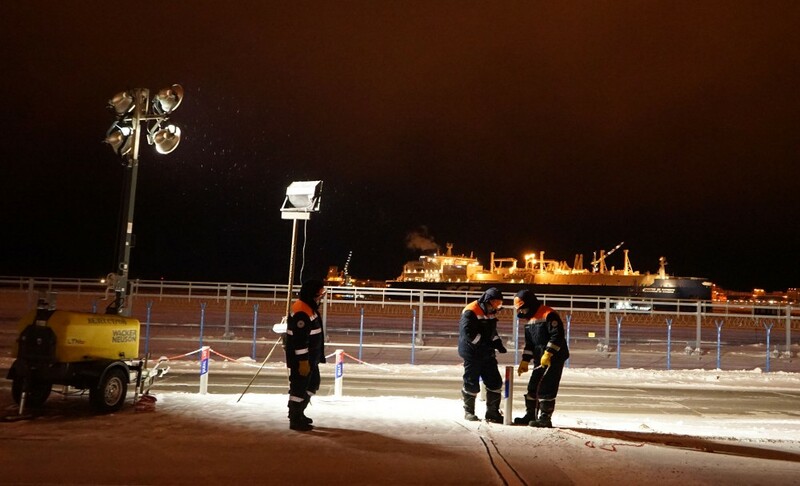 Since December 2018, the Norwegian Arctic town of Honningsvåg has been a core component in the export of Russian Arctic natural gas. The LNG is shipped from the port of Sabetta in the Yamal Peninsula to the Norwegian port where it undergoes reloading from Arctic tankers to conventional carriers. It is subsequently shipped further to international buyers. Novatek is now producing LNG at full capacity in Yamal, which means an annual production of up to 16,5 million tons. At the moment, the lion’s share of it is shuttled to Norwegian waters. It is the Tschudi Group, a Norwegian logistics company, that is handling the reloading operations. In a comment, Tschudi Chief Executive Officer company’s Jon Edvard Sundnes makes clear that the wind has made reloading impossible. The company has not commented on the reported decision by Novatek to move out of Honningsvåg. The two companies have an agreement that covers the period until June this year. Up to 158 ship-to-ship reloading operations can be conducted as part of the deal. The tanker jam off the coast of Norway made at least one of the Arctic carriers to skip reloading and instead independently proceed to to the gas destination point. Information from MarineTraffic shows that the «Boris Vilkitsky» now is on its way to the Belgian LNG terminal in Zeebrugge. Among the vessels that have been awaiting reloading in Honningsvåg is the brand new «Nikolay Zubov», the latest in the fleet of Arctic carriers that deliver LNG from Yamal. The ship was handed over by South Korean shipyard Daewoo Shipbuilding and Marine Engineering to Greek company Dynagas in January this year and is working on a long-term contract for Yamal LNG. A total of 15 tankers are built for the Russian Arctic project. Ten of them are already shuttling between Sabetta and Honningsvåg. Since before it started the operations in Honningsvåg, Novatek has made clear that the ship-to-ship reloading is temporary and that a permanent base is to be built. The company plans permanent reloading terminals both in Kamchatka and in the Kola Peninsula, but these will not be completed before year 2022. The terminal in Murmansk region is likely to be based in Ura Guba, in the same fjord where the Northern Fleet has a strategically important submarine base.